Nowadays, more than 25% of the eggs consumed in the world are in liquid form, either Whole, White or Yolk, or sweet or salted preparations. ACTINI lines are designed to produce formulated and pasteurised eggs with similar functional qualities of fresh eggs. Our expertise of over 30 years in the egg treatment has enabled us both to select the most successful technologies to produce a high-quality egg product which can be stored for a very long time and to answer to the high requirements of this market in terms of food safety and productivity. Breaking machines equipped with systems of exclusive breaking which guarantee the best yield available on the market and an incomparable quality of the finished product. 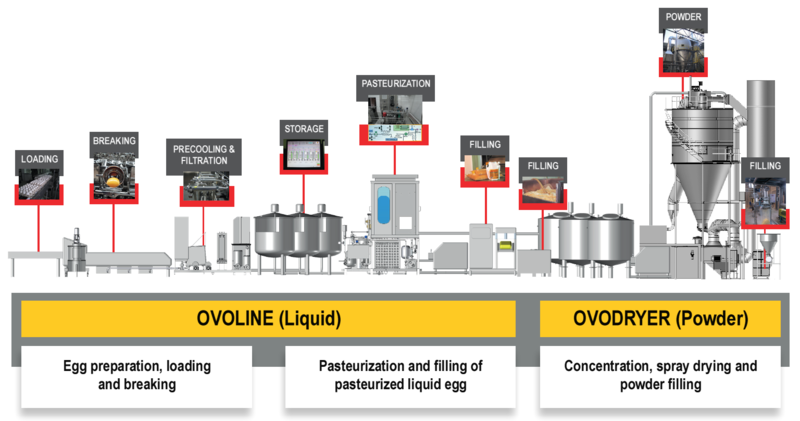 Pasteurizers, equipped with a combination of patented technologies, which offer thermal performances enabling to eliminate any potential pathogenic microorganism to obtain a healthy egg offering a shelf life of more than 8 weeks but especially an egg with preserved functional properties for an optimal use in industrial application. Processes of ultrafiltration and drying developed and patented by ACTINI to obtain egg powders appreciated by the industries as regards their microbiological and functional qualities. To support and advise you to define your investment project, offer you progressive solutions taking into account growth perspectives of your activity. To train you in the use of the machines, bring you the product experience necessary for the success of any project connected to food processing and enable you to work in optimal conditions of hygiene and safety. See our article: Why invest in egg products?